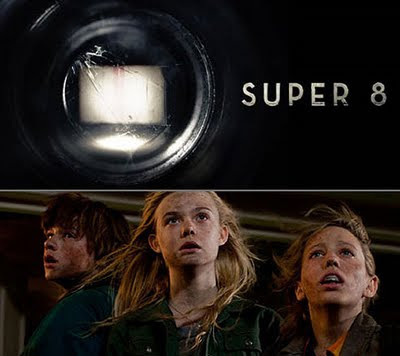 There were times in my childhood that reminded me a lot of the events in Super 8, a J.J. Abrams-directed and Steven Spielberg-inspired film that follows a band of teenagers in a rural Ohio town in 1979 and the incredible events that happened there that summer. Being a Generation Xer like J.J. Abrams, this movie reminded me of what it was like to grow up in the 1970s and 80s - of simpler times when the biggest concern a kid had was whether or not the cute girl from school noticed you. It was a time to discover new possibilities and dream of the future (it's then ironic and thought-provoking, of course, that as an adult, one dreams more and more about the past). Super 8 tells the story of Joe Lamb (newcomer Joel Courtney), a young boy who recently lost his mother, and a collection of his friends who are spending their summer vacation making a zombie movie. One evening, on the night that Alice, the pretty young girl in town (Elle Fanning), joins the makeshift cast, the young filmmakers witness a horrible train wreck that starts a chain of unexplained events in their little Ohio town. What sets this movie apart from other blockbuster fare is that this is a coming-of-age story set against the backdrop of a mysterious alien conspiracy - rather than a story about aliens that needed some kind of plot in the background. In fact, the extraterrestrial in this film is less important than the relationships among and the exploits of the teens on screen. This change in moviemaking perspective draws the audience in a little further than a typical summer popcorn flick. No matter what age we are, many of us can easily identify with times like these (whereas the imagination needs to work overtime to identify with alien invasion stories). This allows us to see the real story - of a young boy and his widower dad who are having a tough time letting go of the woman in their lives suddenly taken from them after an accident at work. It gives us the freedom to pay attention - to the new world opening up before young Joe in the form of an amateur movie production and a burgeoning crush on the new girl in his life. Changing Super 8's perspective also shows us the struggle that the faceless government operatives are dealing with - the challenge of imprisoning an alien life form or letting their monster go home. Sure, there are great special effects, frightening abduction sequences, a noisy firefight between the soldiers and the creature on the streets of a small town, and conspiracy theories running underneath the surface of this film. But those all make way for the thread that unites all the characters: knowing the time to hold on or to let loose. In the Scriptures, the author of Ecclesiastes outlines the balance we face every day between extremes - birth and death, reaping and sowing, and in one verse, "a time to discover and a time to forget. a time to hold close and a time to let go." (Eccl. 3:6). In this story, so many characters must find that balance - between discovering new possibilities and forgetting the pain and agony of the past, between holding and clinging onto the things that drag them down and letting go of the things that keep them from reaching new heights. Joe must overcome the hurt and pain of his mother's death. His father Jackson (Kyle Chandler) must learn to forgive the people who accidentally caused his wife's passing. Alice's father Louis (Ron Eldard) must get past his drunkenness and guilt to be a good father and a respectable member of the community. The military men must let go of the alien in their possession for decades - and allow the creature to go home to the stars. There are times for all these things, as the author of Ecclesiastes says, but in prayer and self-reflection, we can begin to know when is the best time for each. In our own lives, when is it time to hold close to the memories of the past - of our dearly beloved friends and family, of nostalgic journeys into a childhood in the 70s and 80s, of past sins, failures, and hurt? And when is it time to put those things to the side - and discover a new world in our future? We wrestle with knowing the best time for each of these in our lives. Where in our life are we unbalanced? Where in our journey of faith are we too extreme in one direction? What have we forgotten? What do we need to let go of, even if for a short while? Seeking balance and being at peace with ourselves can seem like a daydream, but God calls us to live in that tension - and to keep finding ways to achieve that inner calm that results from a balanced soul. Then we can be as confident as Ecclesiastes and say with that book's author that there is an appointed time for every thing under heaven. Hi - I am really glad to find this. cool job!